Tag line: "Greater than the imagination of the best writers!" Based on the true story of Father Edward Joseph Flanagan, who, in 1921, established Boys Town, a small community outside Omaha, Nebraska, designed to give orphaned and wayward boys a place to call home, 1938's Boys Town stars Spencer Tracy as the good father, who fought both the banks and politicians to keep his facility (which, at its height, housed some 500 kids) going strong. Providing a place to live as well as a future for the young men in his care (giving them a basic education while also teaching them a trade), Father Flanagan lived by the credo that “there’s no such thing as a bad boy”. This belief is challenged, however, with the arrival of Whitey Marsh (Mickey Rooney), younger brother of convicted murderer Joe Marsh (Edward Morris). Cocky and street-wise, Whitey has a hard time fitting in, but when his actions lead to a near tragedy, he runs away, only to become embroiled in a scandal that, if the authorities have their way, could close the doors at Boys Town for good. Though he was only 17 years old at the time he made Boys Town, Mickey Rooney was already a seasoned Hollywood pro, having acted since the age of six in shorts and feature films (in 1935, he played Puck in director William Dieterle’s version of Shakespeare’s A Midsummer Night’s Dream). As the often stubborn Whitey, Rooney has a few good scenes (those moments late in the movie when he breaks down and cries are especially effective, and pack quite an emotional punch), but, in the end, it’s Spencer Tracy’s understated performance as Father Flanagan that makes Boys Town the tearkjerker it is. From the moment he first appears, comforting convicted killer Dan Farrow (Leslie Fenton) less than an hour before he’s to die in the electric chair, we get a sense of Father Flanagan’s selfless nature, and spot the inspiration in his eyes when Farrow says his life might have been different if he had just one friend when he was 12 years old. Armed with the basic philosophy that there’s no such thing as a bad boy, Father Flanagan raises the money needed to start Boys Town from friends such as businessman Dave Morris (Henry Hull), and then works tirelessly to make his dream come true. From his calm approach when dealing with the financiers (who constantly try to shut him down) to the way he handles the volatile Whitey, Tracy brings Father Flanagan’s generosity to the surface in just about every scene, and in so doing gives the film its heart and soul. 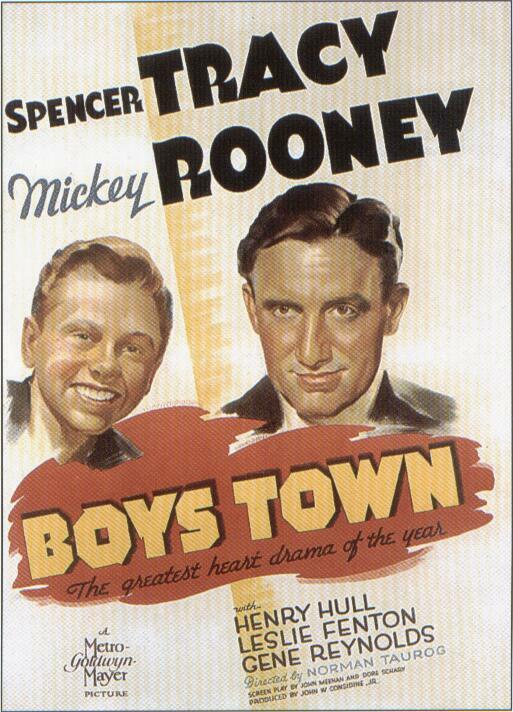 There’s not a second in Boys Town where Spencer Tracy looks as if he’s acting, which is the mark of a great performance. A noble, caring individual who transformed Boys Town into a safe haven for young delinquents, Father Flanagan was clearly an exceptional man, and Tracy, at his absolute best, brings him convincingly to life.